Management - In todays dynamic and diverse environment, Facebooks Chief Executive Officer (CEO), Mark Zuckerberg is required to possess three vital management skills. 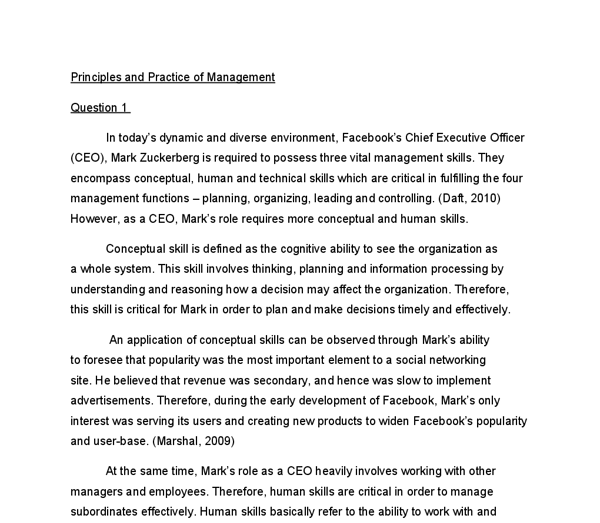 ﻿Principles and Practice of Management Question 1 In today?s dynamic and diverse environment, Facebook?s Chief Executive Officer (CEO), Mark Zuckerberg is required to possess three vital management skills. They encompass conceptual, human and technical skills which are critical in fulfilling the four management functions ? planning, organizing, leading and controlling. (Daft, 2010) However, as a CEO, Mark?s role requires more conceptual and human skills. Conceptual skill is defined as the cognitive ability to see the organization as a whole system. This skill involves thinking, planning and information processing by understanding and reasoning how a decision may affect the organization. Therefore, this skill is critical for Mark in order to plan and make decisions timely and effectively. ...read more. Human skills basically refer to the ability to work with and through people. Mark displays this by allowing staff at Facebook to interact openly by expressing themselves without fear. At the same time, Mark employs the open concept, where all employees, no matter rank or title work in the same open space. Mark even went to the extent of placing his table at the geographical centre of the new Facebook headquarters, allowing employees to interact with him regularly. Mark also plays numerous roles as CEO of Facebook. They can be categorized into informational, interpersonal and decisional roles. Informational roles refer to activities used to maintain and develop informational framework. (Daft, 2010) Such can be seen from Mark as he monitors closely the growth rate as well as development of new products within Facebook. ...read more. (Daft, 2010) Finally, Mark is involved in decisional roles within the company. Decisional roles include making choices and taking action. As CEO and founder, he is regarded as the entrepreneur of the company ? responsible for improvement and delegation of responsibilities. This is clearly portrayed by Mark as he hired Sheryl Sandberg to run business operations and later invented a new role called ?VP of Growth? to manage the expansion of Facebook. (Charlson, 2010) As a conclusion, Mark Zuckerberg applies conceptual as well as human skills when executing his role as CEO, leading to the current success of the social networking giant, Facebook. Reference list; Charlson, N. (2010), ?How Zuck Learned to Run Facebook?, Business Insider, viewed 9th April 2011, < http://www.businessinsider.com/meet-the-guy-who-taught-mark-zuckerberg-everything-he-knows-about-management-2010-6#ixzz1J0mWVpdv> Daft, R.L (2010), New Era of Management, Cengage Learning, Canada Marshall, M. (2009), ?Mark Zuckerberg: The Evolution of a remarkable CEO?, Venture Bear, viewed 9th April 2011, < http://venturebeat.com/2009/10/02/mark-zuckerberg-the-evolution-of-a-remarkable-ceo/> ...read more. 3,5 Outline The Purpose And Benefits Of Recycling The explanation of recycling is not to waste anything. When you recycle plastic, metals, papers etc they will be made into new plastic, metal and paper and will be used all over again. If firms do not change, they will cease to exist. In order for firms to understand its environment, PEST analysis and SWOT analysis may be carried out. The PEST analysis is like a scan of the external macro-environment in which firms operate in (netmba.com). as 60% of people answering were from the town itself, and 71% listed their reason for not using a local bakery as that they don't have one. Location close to home was also listed as the highest scoring quality which my prospective customers look for in a business. Theorist: Maslow Theory name: Hierarchy of needs I have found this image from: http://en.wikipedia.org/wiki/Image:Maslow%27s_hierarchy_of_needs.svg Maslow developed this hierarchy of needs based on research about what motivates people to work. He suggested that there were 5 levels of needs that influence a person's behaviour. all business with in the industry coincide with the act thus making the said business safe for consumers to visit. In turn shows that customers are looked after and avoid any negative attention surrounding food safety. The employment law for a set minimum wage. This is determined by the imports and exports of goods, services, financial capital and financial transfers. International debt is where the business owes payments through debt. The collection agencies operate as agents of creditors. The agencies will collect debt from these businesses on a percentage of the total amount owned by the business. Their supplier base includes: direct suppliers (approximately 165 000 companies), 680 000 individual farmers Interest/aspiration High Low Key players (Customers) Keep satisfied (Shareholders) Keep informed (Community) Minimal effort High Power/influence Low 2.2. 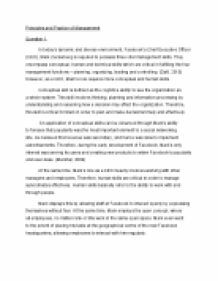 Responsibilities of Nestlé and the strategy to accomplish 2.2.1.